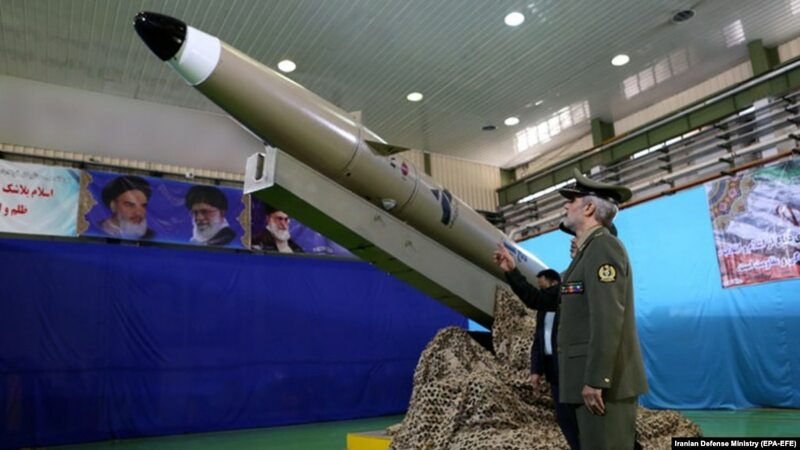 Radiofarda – Iran unveiled a next generation short-range ballistic missile on Monday and vowed to further boost its capabilities, Iranian media said, at a time of rising tensions with the United States. State broadcaster IRIB said the new Fateh Mobin missile had “successfully passed its tests” and could strike targets on land and sea. “As promised to our dear people, we will not spare any effort to increase the missile capabilities of the country and we will certainly increase our missile power every day,” Defene Minister Amir Hatami said, quoted by conservative news agency Tasnim. The new missile’s range was not given, but previous versions had a range of around 200 to 300 kilometers, according to the US-based Center for Strategic and International Studies. US officials told Fox News last week that a “Fateh-110 missile” was test-fired by Iran during naval exercises in the Strait of Hormoz last week. “Nothing can stop this missile because of its high degree of flexibility,” said Hatami, adding that the new version of the Fateh Mobin was “100-percent domestically made… agile, stealth, tactical (and) precision-guided”. “Be sure that the greater the pressures and psychological warfare against the great nation of Iran, our will to enhance our defense power in all fields will increase,” he added. President Donald Trump pulled out of the 2015 nuclear deal with Iran and world powers in May. Iran’s missile program is a major bone of contention, particularly with the United States and its allies, but is seen as vital by Iran to its defensive posture in a troubled region.